Newb to OF and PI, how to compile? Hi, I have been using OF for a little bit now, and trying to it to run on a PI for a school project. I have it all installed as far as I can tell but stuck on the last set of instructions from the setup guide. When I run that - it does stuff in the terminal - but should I be seeing the graphic pop up after it compiles? Not sure what I should be expecting here! so just run make RunRelease, the graphical interface should pop up unless you have ofNoAppWindow in your main.cpp. If it’s an example, the window should pop up there is no examples without windows on the of_v0.10.1_linuxarmv6l_release . Well this is odd, unless you are running it through a Virtual Network Computer, the window should pop up. 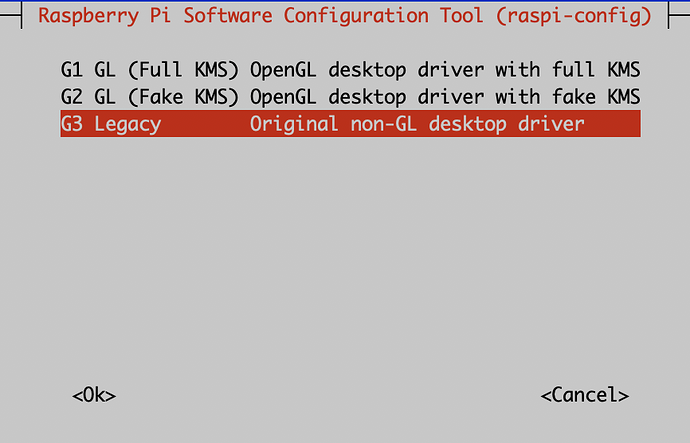 Did you change the settings for the GL Driver to be legacy? I just tried it -just now- with a fresh install from saturday on mine, and it works fine. Did you follow all the steps from the guide? In particular installing the dependencies, and maybe you also need to install the codecs? Ah! I am running through VNC, apologies if that was required information! I’ll try tomorrow and report back, thanks for going to that effort! Thanks for the help, I’ll be around!